Address: 431660 Republic Mordovia, Ichalkovsky r-n, pos. Smolny. 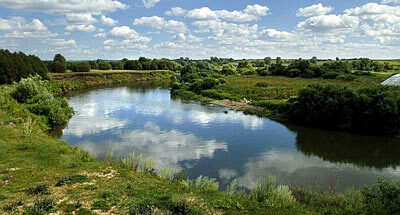 National Park Smolny, in Ichkalovsky District of Republic Mordovia, was established in 1995. Its area is 36,5 thousand ha. The Park is situated on the left bank of the Alatyr River. The relief is broken with raviness, rising from 36 to 217 m above the sea level. 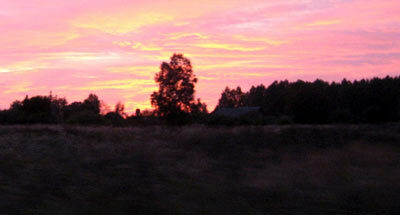 The Alatyr floodplain has some scenic hills (near the village Malye Ichalki, Smolny town). The lowlands between the hills contain a large number of springs. The floodplain lakes Dubovoe 1 (4 ha) and Dubovoe 2 (5 ha) are fed by active springs situated at a depth of 4-5 m.
The river network comprises the Alatyr River (40 km within the Park boundaries) and more shallow rivers — Yazovka (on the Western border), Koldoba, Kalsha, and Ashnya. 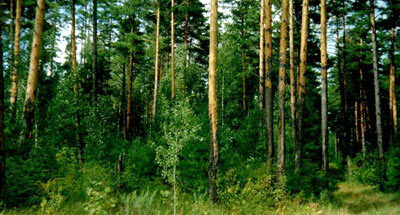 The nature complexes of sub-taiga coniferous-broad-leaved forests and floodplain oak forests are protected. Woodland accounts for 87% of the Park area. Pine forests prevail — those with Hylocomium, Dicranium, Rhytidiadelphis; those with lichens, mixed pine forests with deciduous trees and shrub layers; those with an admixture of spruce. Oak forests and linden forests are common. Very widespread are eutrophie fens and floodplain meadows; there are some plots of mesotrophic and sphagnum bogs with cranberry. 40 vascular plants rare for Mordovia are recorded, including some species listed in the Red Data Book as perennial honesty, caltrop, military orchis, spurred coral root. The common mammals are the moose, sika deer, wild boar; the roe deer, lynx, and the brown bear occasionally appear. The numerous species are the marten, weasel, beaver, muskrat. The Park provides nesting grounds to 130 avian species. The capercaillie, black grouse, hazel grouse are sighted; on the edge of forests and meadows, the common partridge occurs. In the Alatyr floodplain waterbirds concentrate, including geese (gray goose — Anser anser), bean goose (Anser fabalis), white-fronted goose (Anser albifrons), ducks, gulls, catchers. The Park provides nesting grounds to the crane. It is highly probable that the nesting grounds of the golden eagle, osprey can also be found. Dwelling in lakes are the pickerel, roach, dace, chub, ide, redeye, asp, tench, etc. The protected and buffer zone account for up to 85% of the area.